Charles Manson and the "Manson Family"
Helter Skelter (1974) is a book by Vincent Bugliosi and Curt Gentry. Bugliosi had served as the prosecutor in the 1970 trial of Charles Manson. The book presents his firsthand account of the cases of Manson, Susan Atkins, Patricia Krenwinkel, and other members of the self-described Manson Family. It is the best-selling true crime book in history. The book recounts and assesses the investigation, arrest, and prosecution of Charles Manson and his followers for the notorious 1969 murders of Leno and Rosemary LaBianca, actress Sharon Tate, and several others. The book takes its title from the apocalyptic race war that Manson believed would occur, which in turn took its name from the song "Helter Skelter" by The Beatles. Manson had been particularly fascinated by the Beatles' White Album, from which the song came. 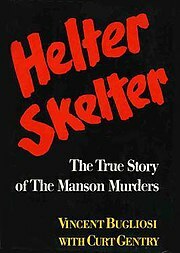 Helter Skelter was first published in the United States in 1974 and became a bestseller. The book won the 1975 Edgar Award for Best Fact Crime book, and was the basis for two television films, released in 1976 and 2004. At the time of Bugliosi's death in 2015, it had sold over seven million copies, making it the best-selling true crime book in history. The book was also the primary influence for the story line of the 2008 movie The Strangers. Since its initial hardcover edition, the book has had several printings as a mass market paperback. A 25th anniversary edition (since the crimes) was published in 1994 with an update added by Bugliosi. Bugliosi himself narrated the Talking Books unabridged audiobook at the time of the book's original release, and read an abridged version of his update for the 25th anniversary edition abridged audiobook read by Robert Foxworth. Audible.com commissioned Scott Brick to read an unabridged version of the 25th anniversary edition in 2011. ^ a b Stout, David (2015-06-10). "Vincent T. Bugliosi, Manson Prosecutor and True-Crime Author, Dies at 80". The New York Times. Retrieved 2015-06-09. ^ a b Rogers, Michael (November 17, 1974). "Manson Meets The Bug: Helter Skelter". The New York Times. Retrieved January 21, 2014. ^ Alexander, S. L. (2004). Media and American Courts: A Reference Handbook. Santa Barbara, CA: ABC-CLIO. p. 170. ISBN 9781576079799. ^ Mustazza, Leonard (2006). The Literary Filmography. 1. Jefferson, NC: McFarland & Company. p. 235. ISBN 9780786425037. ^ Rotten, Ryan (August 1, 2007). "EXCL: Never Talk to Strangers". Crave Online. Retrieved November 8, 2010. ^ Rotten, Ryan (May 26, 2008). "Interview: The Strangers' Bryan Bertino (Pt. 2)". Crave Online. Retrieved November 8, 2010. Partial trial testimony regarding "Helter Skelter"